by David D. Cherry, O.M.D., L.Ac. In April of 2002, Fertility and Sterility, the journal of the American Society of Reproductive Medicine, published the study[G1] that has since become known as “Paulus, et. al.” The protocol initially used in the Paulus study, now know as the Paulus Protocol, has since become the standard of care for the day-of-embryo-transfer (DOET) treatment in most acupuncture fertility clinics, including ours here at Acupuncture Fertility Specialists. Paulus demonstrated that this point protocol administered immediately before embryo transfer and again immediately after embryo transfer increased the success rate of embryo transfer, as compared to the control group, by 16.1%. In May 2006, another study[G2] , Westergaard, et. al. was Published in Fertility and Sterility. Westergaard again clearly demonstrated an increase in the success rate of embryo transfer when acupuncture was performed immediately before and again immediately after embryo transfer. In Westergaard, the increase was 13%. The point selection in Westergaard differed slightly from Paulus. We at Acupuncture Fertility Specialists began doing DOET protocols immediately after Paulus was published in 2002 using the Paulus Protocol. While I don’t entirely agree with the point selection in Paulus, it is the protocol we perform at our clinics on DOET. My thought was, and continues to be, that if Paulus worked that well, I am not inclined to try to fix it, and I’m not willing to risk my patients’ embryos to experiment with other point combinations. Our clinical results, measured in pregnancy rates compared to published numbers from the IVF clinics, were at least consistent with Paulus, if not slightly better in every year since the publication of that study. In October of 2007, at the Annual Meeting of the American Society for Reproductive Medicine, an oral presentation was given of an analysis performed by Craig, et. al., which surprisingly demonstrated a decrease, as compared to a control group, in pregnancy rates where a modified Paulus protocol was administered offsite rather than onsite in the fertility clinics. This sent somewhat of a shockwave through the reproductive acupuncture community initially, as well as causing some reaction from most reproductive endocrinologists who had been referring their patients to acupuncture. Various theories have been advanced as to why Craig, et. al. is so disparate from prior studies. Initially, it appeared that the difference was the onsite (in the fertility clinic) acupuncture as compared to the offsite (in the acupuncture clinic) treatment. No indication of the distances traveled between the acupuncture and fertility clinics is given in Craig, et. al. After the publication of Craig, et. al., some reproductive endocrinologists modified their recommendations to patients regarding acupuncture and DOET. In our clinics, we experienced a number of requests for modifications in the protocol from the reproductive endocrinologists who referred to us. But also, a substantial number of them concluded, based on the fact that Craig, et. al. was so dramatically different from prior studies, that it might simply be a flawed study. Obviously, further investigation is indicated. While we appreciate the results of Craig, et. al., the question becomes that of travel. It is apparent in Craig, et. al. that the travel to and from the acupuncture clinic may have negatively impacted the outcomes of these patients. However, in virtually all cases that I am aware of, the patient has to travel from their home to and from the fertility clinic on the day of transfer. In many cases, the distance the patient travels to and from the fertility clinic from her home is often substantial. I frequently see patients who travel 50 or 60 miles to get to the fertility clinic for transfer, only to get in the car and do the return trip a couple of hours later. This is an item for further investigation at a later date, hopefully. Whether or not Craig, et.al. was an accurate depiction of events on day of transfer, we do believe that the patient should remain as restful and quiet as possible on transfer day. We do our best to minimize travel. In some cases, where we have prior agreements with the fertility clinics, we are able to do onsite acupuncture DOET. Paulus, et. al. and Westergaard, et.al. clearly demonstrated that acupuncture improves IVF success rates done onsite. We arrange onsite DOET wherever possible. In other cases, onsite DOET is not possible, and we modify the arrangements accordingly. We are very fortunate to share a great working relationship with Robert Greene, M.D., Medical Director at Sher Institute of Reproductive Medicine in Sacramento. At SIRM, we frequently treat Dr.Greene’s patients on their DOET utilizing the Paulus Protocol onsite. Dr. Greene has shown us, through his unwavering hospitality, that he is in favor of the day of transfer protocol that we use in particular, and of acupuncture in general. I believe his patients are clearly well served utilizing a combination of his assisted reproduction methods and our acupuncture complement. Further information regarding acupuncture treatment to complement assisted reproductive therapy may be found at our website, www.acupuncture4fertility.com. I’d like to introduce Ms. Cindy Bailey—a woman that successfully overcame infertility as a result of her insight that her diet could impact her chances of conception. It’s no secret that what we eat plays a critical role in our health. Just as a healthy diet can support your heart and fight against cancer, it can also have a huge impact on your reproductive health. When eating for fertility, the goal is to increase the availability of nutrients that support your reproduction, as well as your overall health. You’ll also want to eat to support your hormonal health – because those finely tuned balance of hormones is so important to fertility and conception. To do this, you’re going to want to get rid of the “bad” foods, those which overly tax or stress your body, and keep or add in the “good” foods, those which provide wonderful nutrients and are good for the health. I believe it’s more critical to get rid of the “bad,” so let’s look at what you should take out of your diet. The main foods (or substances) you’ll want to eliminate include alcohol, caffeine, trans fats, processed sugar, artificial sweeteners and overly processed foods (including all those bottled sodas and beverages!). These foods have a negative impact on our fertility. Processed sugar, for example, negatively affects blood sugar and insulin levels, leading to hormonal imbalance. It also causes inflammation in the body and suppresses our immune system. Another example: Alcohol disrupts the absorption of nutrients, weakens your immune system and raises prolactin levels, which in turn inhibits ovulation. So you’ll definitely want to eliminate these. You’ll also want to avoid, or eliminate, wheat and dairy, both because not only are they especially hard for your body to digest, but they are also highly allergenic foods. Many have a sensitivity to wheat, for example, and may not even know it because the symptoms are so mild. This makes wheat especially tough on your body to digest. While trying to conceive, you want to ease the energy used for digestion—the most labor-intensive function in the body—so there is more available to nourish and heal other systems in your body, such as your reproductive system. As for the “good” foods, you’ll want to eat an all-organic diet that includes plenty of vegetables (at least 5 servings a day! ), lean protein, beans, good carbs, nuts and seeds, and healthy fats. Low-mercury seafood is also a great choice, in moderation, as are fresh, whole fruits instead of fruit juice, which contains too much concentrated amounts of sugar. Also, natural forms of sugar, such as raw, organic or all-natural honey, maple syrup and brown rice syrup are OK in moderation. If you eat meat, I emphasize eating it only in organic and lean forms. By eating meat that’s organic you avoid added growth hormones that affect our own hormones negatively, and you avoid any antibiotics used on the animals. By eating meat lean, you avoid much of the dioxins—which are industrial chemicals ingested by animals regardless of organic farming practices that often settle into the fat of those animals. Beans – Not only are they packed with protein, fiber and nutrients important for fertility and pregnancy, such as calcium, iron and potassium, but they also contain a high percentage of folate (a B vitamin), which boosts fertility in both men and women and helps prevent neural tube defects at birth. Beans are also low in fat, good for digestion and a great source of antioxidants. Nuts and seeds – They are high in protein and healthy fats, which help stabilize blood sugar levels, ease inflammation and boost fertility. Estrogen is made and stored in fat, so you definitely need fat, you just want to be sure to eat the healthy kind. Nuts and seeds also contain essential minerals and fiber, which is important for the health of the digestive system and lowering cholesterol. Good choices for seeds are pumpkin and sesame, which also contain zinc, and for nuts, almonds and walnuts. Avocados – This fruit is great for fertility! Not only is it packed with folate, it’s also high in monounsaturated fat. That’s the good, healthy kind of fat, which helps to lower cholesterol and plays such an important role in our endocrine system, which regulates the hormones involved in reproduction. Finally, avocados contain good enzymes which aid digestion and when you’re trying to conceive, anything you do to lessen the impact on digestion helps! Avocados are also high in fiber, which helps regulate blood sugar levels, and are filled with other great nutrients, such as potassium, vitamin B6 and vitamin C.
Eating this way not only optimizes fertility and chances of conception, but is great for overall health too. Give yourself time to adjust to the diet, though, and don’t skip visiting your doctor to assess your particular needs. 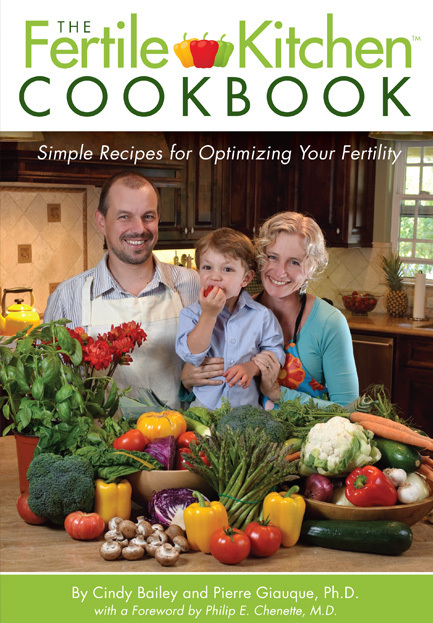 Special Note: SIRM is hosting the book launch party for authors Cindy Bailey and Pierre Giauque on June 24, 2010, 6:30 to 9:00 pm to celebrate their fertility cookbook. This exciting event includes plenty of healthy food, wine, music, a cooking demo and a free raffle drawing for fertility medication, a copy of the book, wine and much more. Dr. Robert Greene will also give a brief talk and be available, along with the authors, to answer questions. “For years, yoga has played an important role in my life. It not only helps me manage the stressful life of a fertility specialist but also assisted my wife and me in having our daughter. Since it’s much more difficult to design research studies to prove the benefits of yoga; I thought I’d share another compelling story with you by introducing you to a friend of mine, Lindsay Brin. In August 2007 I went through my 3rd IVF. I knew I had the best doctor and it looked like the odds were on my side. But still I could not get over the emotional & physical turmoil of infertility. Why does my sister-in-law hold hands with her husband and get pregnant? Why did we increase my Gonal? Why did I fill my bladder too much before ET? How does my husband put up with me right now? Why? Why? Why? Then I realized I was only in control of one thing, my body. I couldn’t control the situation I was put in but it was time to take control of my attitude, emotional well-being, stress and physical body. Having been a pre/post-natal fitness expert for several years I knew the incredible benefits of exercise and yoga. So why didn’t I apply them through my 1st IVF? Well, I’m not really sure. All I know is I was an emotional wreck, 10 pounds heavier and cranky! But if you’re like me, by the 2nd IVF I was willing to do anything and everything to improve my chances! I added acupuncture, read Dr. Greene’s book, Perfect Hormone Balance for Fertility and got back to my daily exercise regime which included yoga. And we did better this time around…but miscarried at 6.5 weeks. This brings us back to August 2007 when I got the best news ever! Betas 32 @ 11dpo and 130 @ 13 dpo! I believe that was always the plan but again I could only control 1 aspect of the situation: my body. Yoga is known for stress relief of infertility and increased blood flow to the uterus. So of course it’s beneficial! But if increasing your chances isn’t enough motivation please listen to me when I say that feeling better about yourself is the reason you should try it! Yoga is a series of postures and exercises that promote control of your body, spiritual well-being and a connection with your body. You can use safe yoga postures to build strength and flexibility along with relaxation to develop or enhance calmness and confidence. Here are some known fertility yoga poses. Savasana- corpse pose, lie with feet falling open and hands to your sides, breathe so deeply the back of your rib cage expands into the floor, relax until the point your feel your limbs getting heavy. Now I am blessed to be pregnant with baby #2 after IVF #4. And the only thing that keeps the swelling away and the energy high is exercise and yoga! I do my prenatal DVDs which have both exercise and yoga on them (although I have to mute myself). So once you do get pregnant continue your yoga program to benefit your body and your baby! If you’d like to know more about my fertility journey please visit my blog www.lindsaybrin.com. You’ll also get to see the good, the bad and the ugly of getting rid of the fertility lbs. and pregnancy weight gain!